I am part of Burlington Beer’s bottle reserve club for the first two years. Most are beers that can be aged so I have not reviewed many from the first 18 months of the club. Bumbleberry Saison is a fruit beer best enjoyed fresh so I decided to open this one shortly after picking it from the brewery. I also wanted to open it shortly after Seed from Bissell to compare the two. What I found were two entirely different beers. 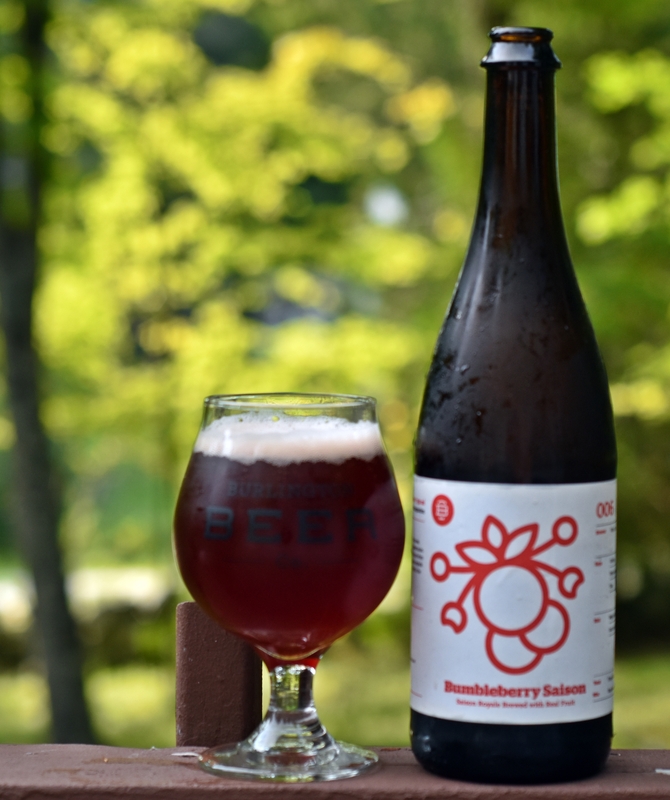 Bumbleberry Saison is a big saison at 9% ABV and just packed full of fruit flavor. The color is a very deep red almost purple with a thin pinkish head. Not sure I have had a beer this color before. Aroma is loaded with fresh berries, hard to identify any one fruit in particular but they are all there. The first thing you notice in the taste is a solid base saison but then the fruit comes in and just doesn’t stop. At 9% I sipped on this one for a while and it changed a bit as it warmed. The alcohol was more noticeable as it warmed but still relatively well hidden. Overall this was an interesting beer but again a style that just doesn’t too much for me. Looking forward to the others in my ever expanding collection of Burlington Beer bottles. Brewers Description: Saison Royale brewed with Real Fruit. Deep in the forests of an undiscovered land, on the tallest tree you can see, grows a fruit that ripens but only once a year on the night of the harvest moon. The ever elusive, Bumbleberry. We’ve spent years researching where and when to find this fruit to add to our Saison Royale. Bright berry fruit flavors explode with balanced malt and yeast flavors. This beer is meant to be enjoyed in the summer of 2015. Share with the ones you love. Less than 200 bottles available at brewery only. 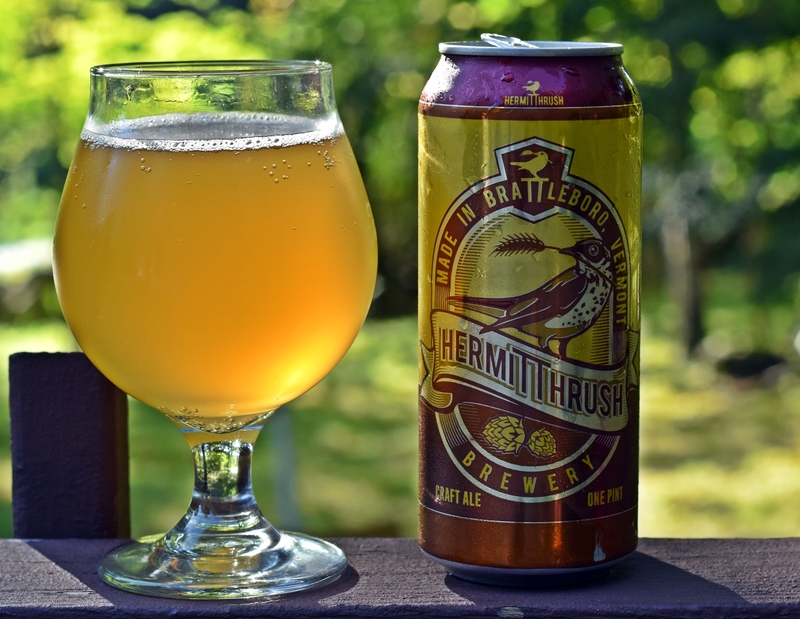 My first beer from Hermit Thrush Brewing which is one of the few breweries in Vermont that is in the southern part of the state. Now that they package in 16 ounce cans you can expect to see more reviews of their beer in the coming months. Brattlebeer sounds really interesting, a sour ale brewed with apple cider, so I brought home a couple of 4-packs during a recent trip to Vermont. Pours a slightly hazy yellow with almost no head. Aroma has lots of cider characteristics and almost no traditional beer aroma. Taste starts with a sour apple tartness followed by a slightly earthy funk and finish is clean and refreshing. An interesting beverage that was easy to drink but not something I would drink on a regular basis. Brewers Description: Inspired by the town of Brattleboro, the unique sour ale captures the best of local flavors. Brattlebeer is slightly tart, light bodied and dry with both fruity and malty undertones, and a rocky, champagne-like head. Fermented spontaneously with a blend of local apple cider, malt, and hops, this delicate pale ale pairs well with soft cheeses and herbal entrees, and often compliments seasonal fruit desserts. 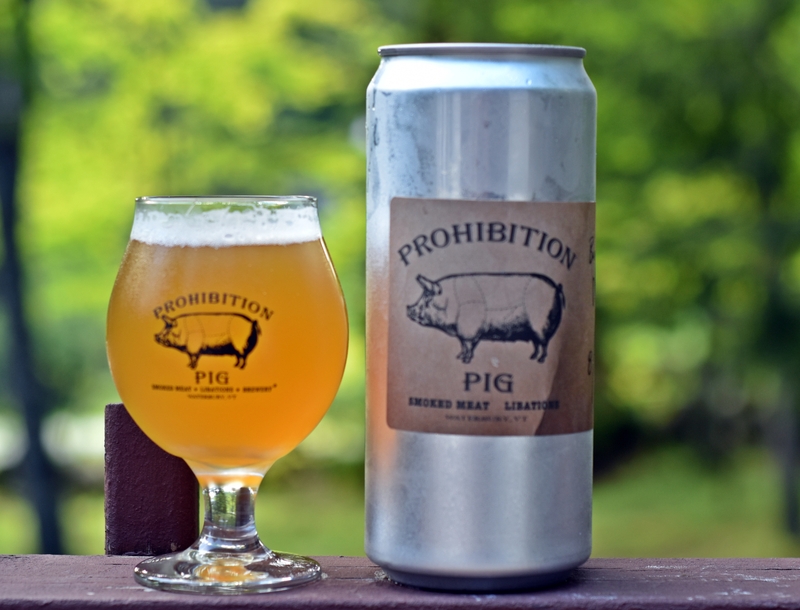 If you spend any amount of time in Vermont you are probably familiar with Prohibition Pig as they are a very popular beer spot in Waterbury. They recently opened their own brewery adding several of their own options to a very solid tap list. The actual brewery is located just behind the restaurant and sells crowlers and 16 ounce growlers. Bantam was the only DIPA that was available when I visited and the only beer I brought home from the brewery. I sampled others when I was there and all were very good. Nice orange color with a thin white head and great lacing get this beer off to a great start. Aroma is slightly sweet and full of citrus goodness. Taste starts with a solid sweet malt base but quickly gives way to the tropical and citrus fruits. Carbonation is light but seemed like that was intentional as the other beers I tried at the brewery had similar levels. Clean, slightly bitter finish with absolutely no alcohol coming through even though it is 8%. 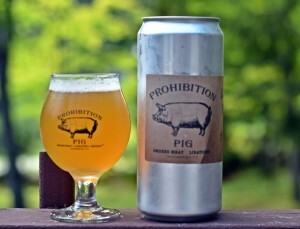 Overall very impressed with the beer from Prohibition Pig and I will have to get out there more often to enjoy the excellent food and bring back more beer. Brewers Description: Hopped with Chinook, Columbus, and Simcoe. 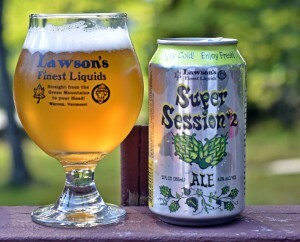 Super Session #2 is Lawson’s second beer to be contract brewed in Connecticut at Two Roads and distributed in cans. Sip of Sunshine was the first and is still much more popular than Super Session #2. I was in Vermont recently and found many places selling 6 and 12 packs of Super Session with no limits while Sip of Sunshine was harder to find and typically limited to one or two 4-packs. Session beers are great but at 4.8% ABV this is on the high side of the session category. SS#2 pours a clear yellow with big white head. Aroma is light as expected with this style but has plenty of citrus and pine. Flavor is similar to the nose, light citrus, floral and a bit of lemon. Finish is crisp, clean with very little bitterness. I liked this beer but Maine Island Trail from Rising Tide and Baby Genius from Bissell Brothers are still my go to session beers. Brewers Description: Super Session #2 is designed to be a light and refreshing beer with low alcohol, yet the full hop character of a Session IPA. Go ahead, you can have more than one… Cheers! Tribute pours a deep hazy orange with a thin white head. Aroma is quite balanced with some sweet malts coming through along with a nice mix of pine, tropical and citrus hops. Taste is more balanced and not as hop forward as some of those mentioned above but it still packs in a nice mix of flavors; pine, slightly resinous and some grapefruit. Finish is dry and only slightly bitter. Overall a very nice beer and one worth seeking out next time you are in Vermont. I need to check out their new brewery as my only trip to 14th Star was in their original location. 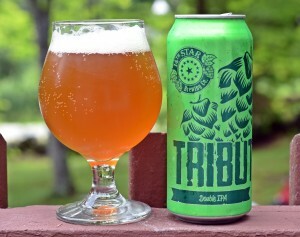 Brewers Description: Our Tribute Double IPA is a celebration of hops, pure and simple. A simple and smooth malt base serves as the stage for the hops to perform. 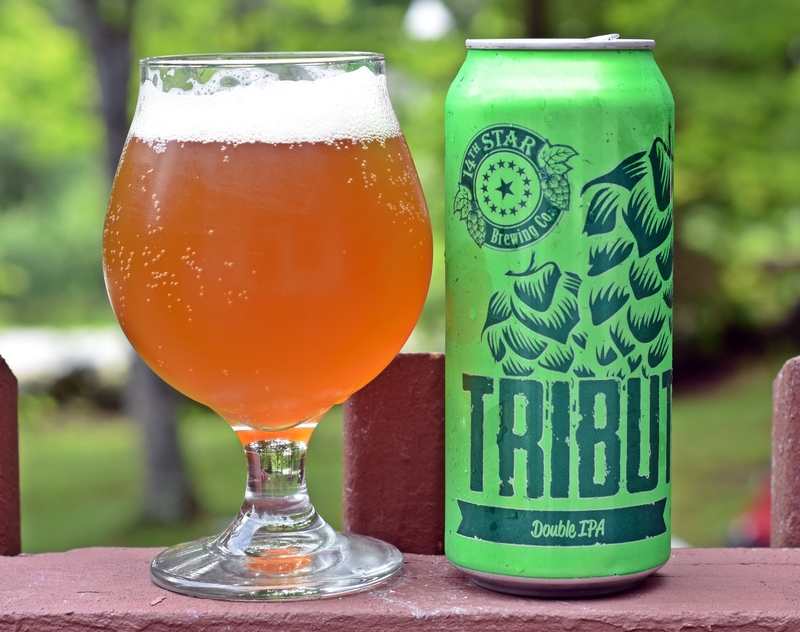 Tribute has a beautiful golden color, an aroma brimming with citrusy hops, and a deliciously smooth hop flavor and dry finish. Works of Love is a new series of beer from Hill Farmstead. These beers were brewed at Hill with the help of a guest brewer. The first in the series is a blonde ale brewed with Earl Grey Tea that clocks in at 3.6% ABV. This is one of many great beers available with an ABV below 4%. This beer is very light in color with a slight haze to it. Aroma was light and mostly citrus but also a bit of lemon grass. Flavor follows with a nice hoppy start and the tea really does not come through until the finish. Very mild bitterness and with the low ABV you could drink this all day long. I have not had many beers made with tea but this is a very well done beer as the tea is just an added layer not something that takes over the beer. Looking forward to more from the Works of Love series. 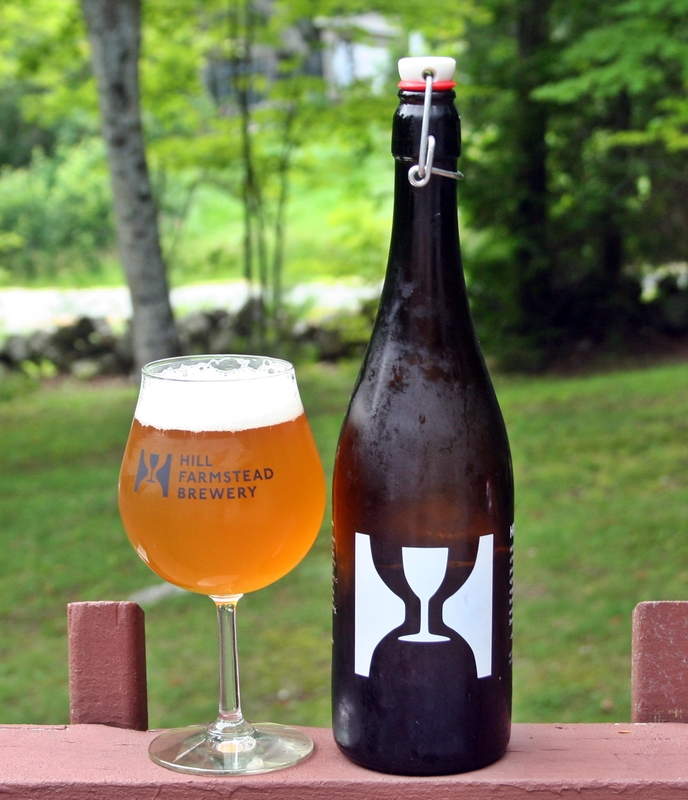 Brewers Description: A new series showcasing collaborations at Hill Farmstead with friends, this one brewed with Ryan Witter-Merithew of Siren Brewing. Low abv, hoppy blonde ale (3.7%) with Earl Grey tea; dry hopped with Amarillo, Citra and Centennial. Somehow in all my trips to Hill I was never able to try the original Society & Solitude. I have had the other 6 versions and they are some of my favorite beers. Fortunately it was available on one of my trips this summer/fall. Society & Solitude #1 is brewed entirely with Cascade hops and it always amazes me the many different flavors a brewer can get from one hop. Appearance is typical of a Hill Farmstead DIPA with a deep slightly hazy orange color and inch thick white head that left loads of lacing on the glass. Aroma is lighter than the other S&S beers but has some floral and citrus. Taste is big on the citrus, grapefruit and also has a bit of floral. A fair amount of bitterness as expected with a big DIPA. 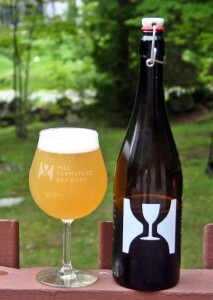 Typical Hill Farmstead mouthfeel, carbonation, etc – which really means exactly the way I like my beers. Overall an excellent beer but not quite as good S&S #5 or #7. Brewers Description: The first in our series of experimental Imperial IPAs – Release #1 is brewed exclusively with Cascade hops (from Segal Ranch) and Weyermann Vienna Malt. Our friend, Jeff O’Neil (the artist formerly known as the head brewer at Ithaca Beer Company… now redesigning the Peekskill Brewery) lent us a hand on the very first and long brew day on our 15bbl brewhouse. Picked this one up via an in person trade at Hill Farmstead a while back. I actually drank the beer over a month ago but just now writing up the review and getting it posted to the blog. Crowlers are relatively new and Four Quarters is only the second brewery that I have tried a crowler from. This is my first beer from Four Quarters but I will have to check them out on my next trip to Vermont as I was impressed. Barleygirl is described as a Belgian Double IPA which may be a first for me. Appearance is a nice unfiltered orange. Aroma is a pleasant mix of spice and sweet malts. Nothing too crazy in either the appearance or aroma but enjoyable. Taste was a bit muted for a double IPA with some sweet malts and a light citrus bitterness. Finish was quite dry and left me wanting more. Overall a quality beer but I’m not sure the combination of Belgian yeast and a DIPA worked for me. It’s been over a month since my last post; crazy busy summer with the family. Fortunately I have enjoyed some great beers and will be getting some of the reviews posted this week. School is back in session soon so hopefully I won’t go as long between posts for the rest of the year. This one from Burlington Beer Company really surprised me as it was entirely different than the many other IPAs coming out of Vermont. Appearance is a deep orange with a thick tan head. Aroma is a very interesting mix of lemon, citrus and a great mix of grains. Taste starts with lots of sweet malts then you get the lemon, citrus and a bit of peppery hops. 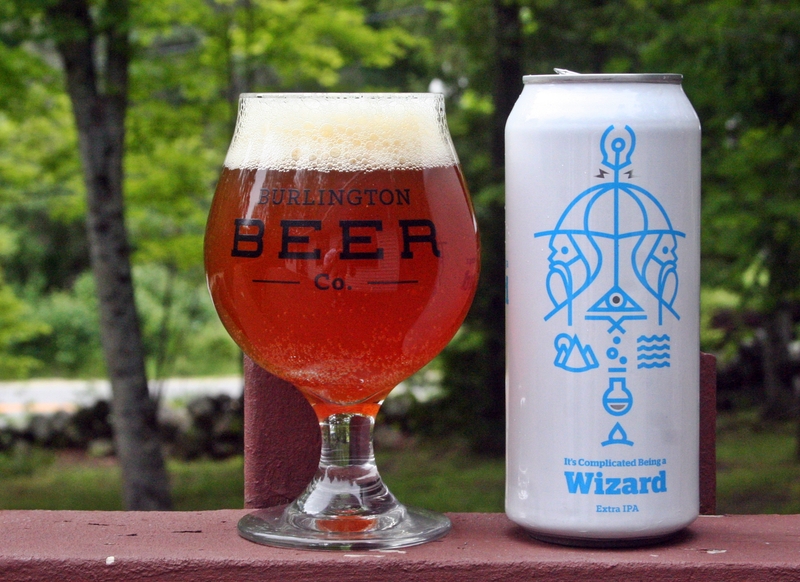 Such an interesting beer and one worth seeking out; just don’t go into it expecting another Vermont IPA like those from The Alchemist, Fiddlehead or Hill Farmstead. Brewers Description: Our extra IPA has a radiant straw orange glow with which we immerse massive quantities of hops per gallon for a bold, yet delicate hop flavor. Utilizing barley, wheat, and oats. 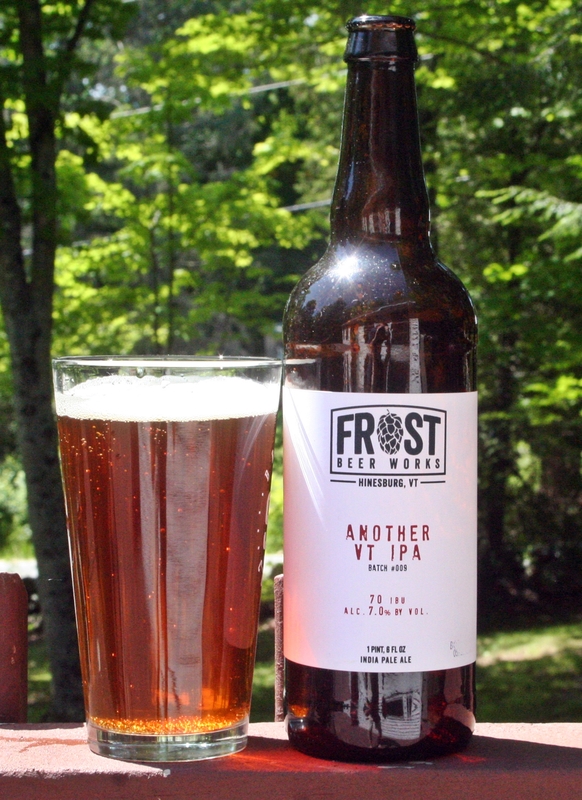 First beer from Frost Beer Works in Hinesburg, Vermont. Have not made it to the brewery yet but that will change the end of the month as I have a 3-day conference in the area and I should have time to stop by and check out the space. In the meantime I traded some Maine beers for some Vermont beers on a recent trip to Hill Farmstead. I like the simple label design and naming structure of Frost Beer Works line up. Deep amber color with a thin white head. Carbonation seemed light and the head disappeared relatively quickly for an IPA. Aroma was mild but pleasant with a mix of tropical fruit and a nice sweetness. Taste is bitter up front followed by the tropical fruits and a sweet malt finish. Odd to have the bitterness on the front end but it worked. Overall this is a very well balanced, refreshing IPA from Frost Beer Works. This was one of the first round of beers released so it may improve as they get things dialed in a bit more. 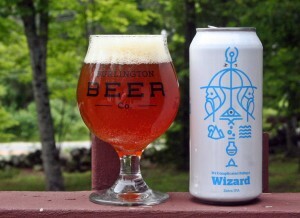 Brewers Description: a balanced, aromatic IPA with six malts, a Mosaic/Citra dry hop, and the signature of VT’s ale yeast. Citrus and tropical fruit aromas from hops complement malt smoothness and nuanced yeast complexity to create a flavor that encourages having another sip.